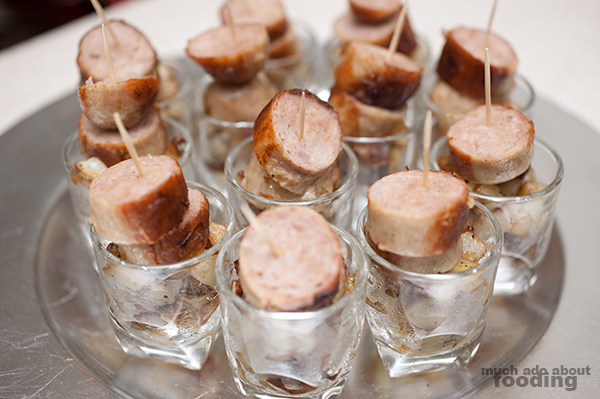 I put this little rendition of "bangers and mash" together for an aptwarming/St. Patty's day shindig. Since I was already using mashed potatoes elsewhere and I had plans for making everything "tasting menu" style, I wanted to switch up how to handle the potatoes portion. 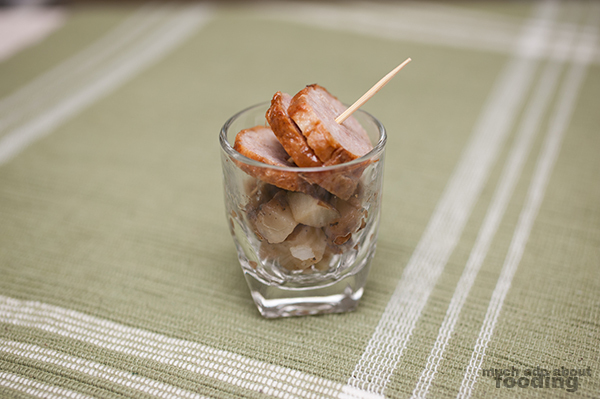 I had small shotglasses to put this item in so needed a way to make it all eatable with just a toothpick. The bangers I got from Costco (thank you for being my wholesale savior, hah!) but the hash was simple to make yet was delicious enough to have run out quickly. They were actually just about the first to go. Try this next time you're thinking of a party idea. If not bangers, another piece of deliciousness on top! 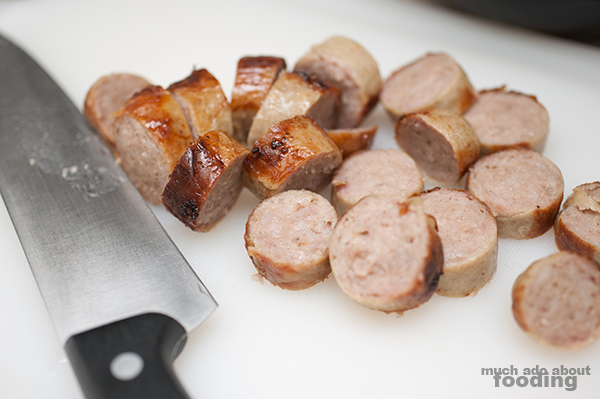 For the bangers, you will actually be cooking them whole before you slice. This will keep them juicier than if you pre-sliced. What may take you the longest time is dicing the potatoes because you'll want the cubes to be about 1/4" all around. Scrub the skin very well before dicing - put diced potatoes into a large bowl with the oil, rosemary, salt, and pepper. Thoroughly coat and let sit. The bangers will be easy. Heat up a medium-sized skillet. 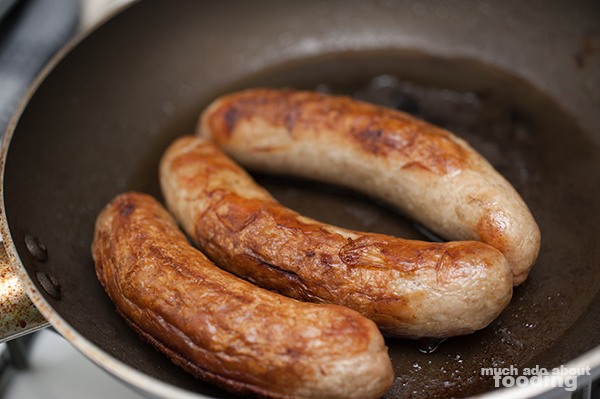 Add just a thin layer of oil to the pan and add bangers once hot. Cook until the skin gets crispy and has browned before turning to the other side. Once whole banger is cooked well, remove to a cutting board. Let it cool before touching. While waiting for it to cool, you can reheat the skillet for the potatoes. 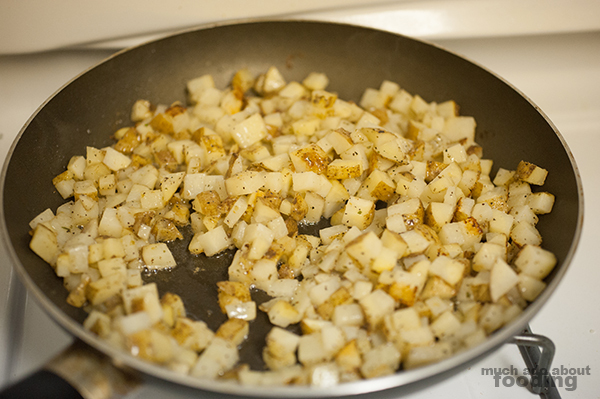 There is enough oil in the potatoes to cook with so throw them onto the skillet. Stir around until most potatoes are just starting to turn a golden brown. Take off heat and spoon into prepared shotglasses. 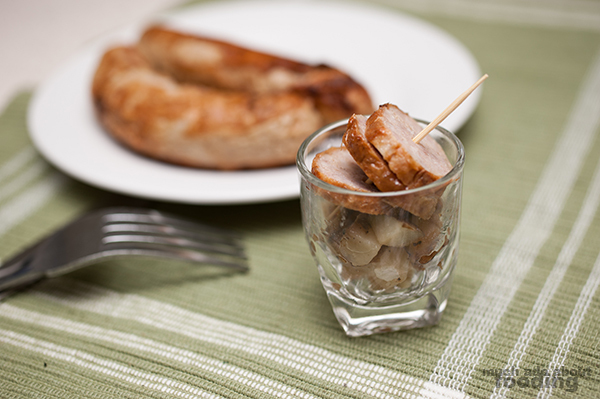 Slice up bangers and skewer a slice or two with a toothpick. Top off shotglasses and serve! Feel free to season potatoes more if you need.